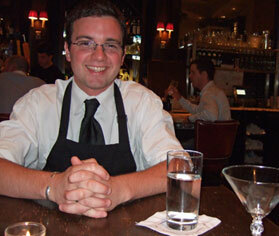 Tom Schlesinger-Guidelli is an unusually seasoned bartender for such a young man. He observes the crowd at Eastern Standard’s expansive bar in a way that’s both practical — he has to be a step ahead of his customers’ requests — and philosophical. He double-majored in anthropology and political science, and, as his friendly half-smile indicates, seems to get a kick out of the manners and rhythms of the couples, tourists, baseball fans, cocktail connoisseurs and diners-in-waiting on parade before him. At Eastern Standard, Tom has evolved into a mixologist, as evidenced by the Jaguar (1 1/2 oz blanco tequila, 3/4 oz Amer Picon, 3/4 oz green Chartreuse, 3 dashes Fee Brothers Orange Bitters, chilled and served straight up with flamed orange peel). This is a unique, sophisticated drink that belongs in any definitive modern text of great cocktail recipes. The Back Eddy in Westport, MA. It had to be a sunny summertime sip of my mother’s gin and tonic. It has to be Green Street. I love their program; both Dylan and Misty are such awesome, nice, unassuming and knowledgeable bartenders. They make everybody feel comfortable and at the same time can recant amazing stories and history of drinks you have never encountered. I get excited everytime I go over there. Pisco Sours or the Pink Lady. Really anything with egg. Dirty or, even worse, extra-dirty vodka martinis. Glass broken in your ice. The rising cocktail scene. It is in an awesome stage, really fledgling, fun to watch. There just aren’t enough places to go drink a well crafted cocktail. Just swung by after seeing Paul’s post on cocktailchronicles.com. I love the bartender profiles. Do you just tell them it’s for a blog and they go for it? Thanks, Rick. Well, yes. I write them an email or letter explaining what drinkboston is (if they don’t already know) and ask if they’re willing to be profiled. No one’s said “no” yet. Tom was our first bartender at Eastern Standard. His cocktail wisdom and craftsmanship and general quirky warmth have made us come back again and again. Cheers!